While skimming thru Facebookland, I came across a post and picture that turned into a “prompt” for me!!! 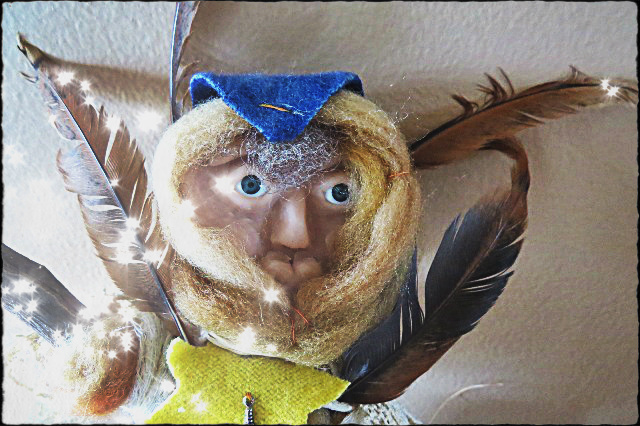 Vintage Supplies showed a photo of one of their Outsider Spirit Dolls, and I thought maybe I should try that! How hard could it be??? I knew I had an old sculpy face in a tin somewhere – one of my earlier failed attempts of years ago (I am much better at sculpting now! )- that would be perfect to use for this project!! All the rest of the items would be scraps and flotsam and thingamabobs from my stash pile. 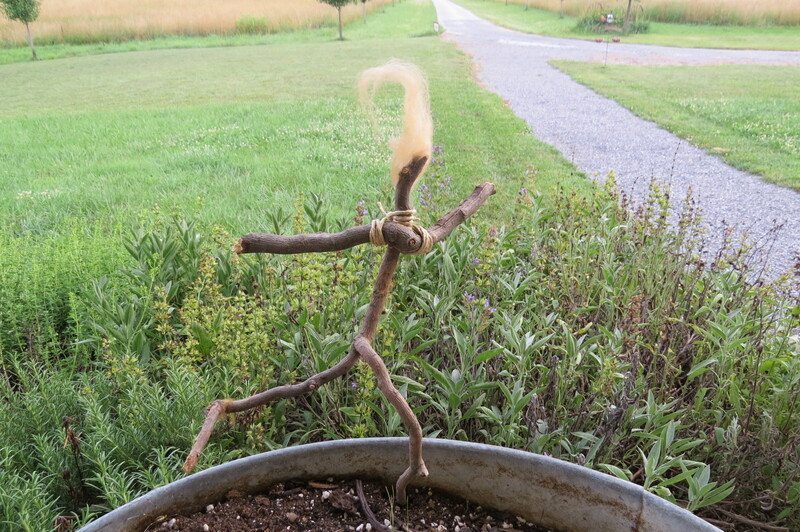 The armature was made of twigs- so I picked some curly Harry Lauder Walking Stick branches that I have been saving for just such an occasion! Now, keep in mind, the doll that inspired this had no legs- but I thought mine should have some. HA! Well, when this creature was finished- he/she was hideous!!! I felt like I wasted 2 perfectly good hours that could have been better spent elsewhere!!! I was planning to tie him/her to the outside of chicken coop- let him/her be their totem- and let the elements have at him/her!!! Weathering could only make this error in judgement BETTER!!! 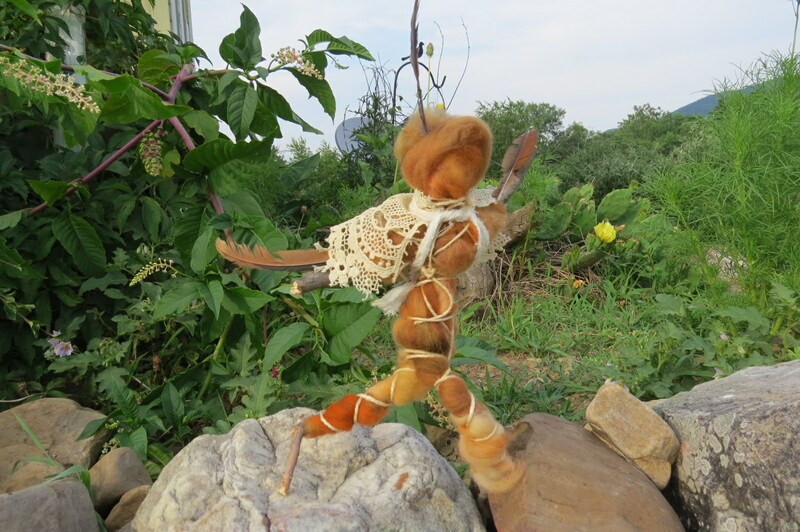 Then, I decided, why waste this perfectly gorgeous wool roving, and the expensive doll eyes…..sooooo, I started to dismantle the little stick being. As it was – attaching the sculpy face was none too successful – all I got were hands full of different kinds of glue – which, in the end- only held the face in place for about an hour!!! Surprisingly, while ripping the face off and taking it apart, a new and much more appealing spirit emerged. Faceless, she was more intriguing, and had a new lilt in her step. With her vintage lace capelet, and chicken feather adornments, she blithely ran along the stone wall of the herb garden. I could tell, even SHE was happier not being weighed down and judged by that unfortunate face!!!! 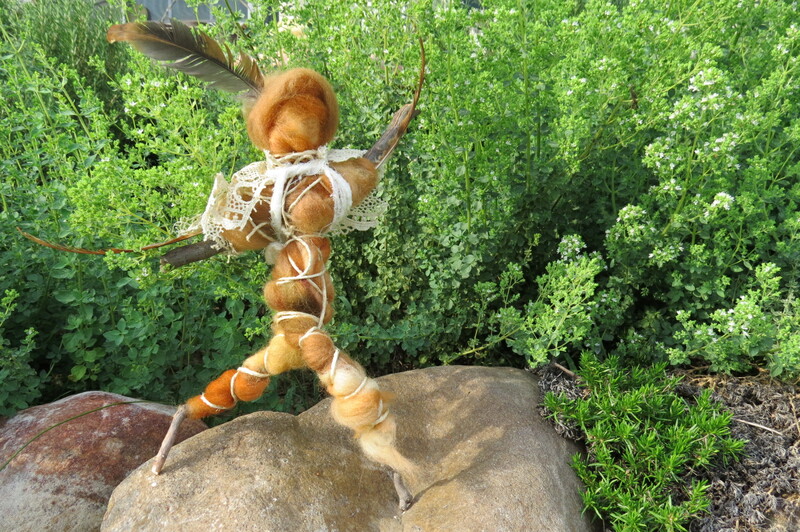 Finally- stripped down to her very base “self “, with a tuft of wool hair waving in the breeze- the once ugly spirit had evolved…….